Continuous modeling is an approach to data center management that supplements infrastructure management (DCIM) tools with engineering simulation tools. Traditional DCIM management tools provide administrators with a federated view of an organization’s building management system (BMS), IT asset management (IAM) and network management system (NMS). For a data center to operate in a resilient and cost-effective manner, however mechanical and electrical systems need to be considered as well. Most engineering analysis tools focus on mechanical and electrical systems separately and can only provide the administrator with snapshots of state data. Although state data can be useful for troubleshooting concerns like air flow once a problem has been identified, it is not useful for preventing problems. Nor can it help the administrator decide how to balance deployment and energy-saving requirements against the risk of mechanical or electrical downtime. Continuous modeling uses the data collected by DCIM and engineering analysis tools such as computational fluid dynamics (CFD). 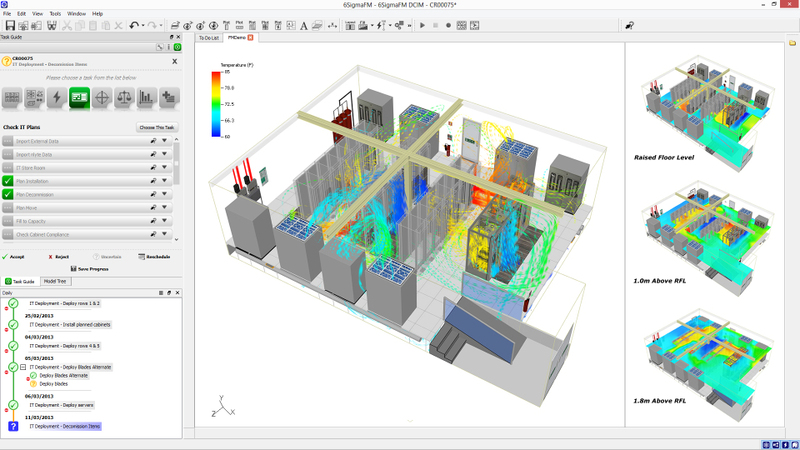 This allows the data center administrator to use real-time data, mathematics and simulation tools to visualize and quantify how mechanical and electrical systems will be affected by a change to the building, its hardware or its network infrastructure. This, in turn, can help the administrator make data-driven decisions for capacity planning and reducing energy costs. As new data comes in, the models can be validated or revised on a continual basis. This entry was posted in Data Center DCIM Datacenter Datacenters Datacentre and tagged 6sigmaDC, 6SigmaFM, capacity planning, CFD, computational fluid dynamics, continuous modeling, Continuous Modeling for DCIM, data center, data center infrastructure management, Data Centre, Datacenter, datacenters, datacentre, DCIM, future facilities, modeling, Predictive DCIM, predictive modeling, Virtual Facility. Bookmark the permalink.